Senior security force officers in the Democratic Republic of Congo mobilized over 200 former M23 rebel fighters from neighboring countries to quash protests against President Joseph Kabila in December 2016, Human Rights Watch said in a report released on Mondat (December 5). Kabila has since strengthened his hold on power and delayed elections, raising concerns that planned protests will be met with further violence and repression. 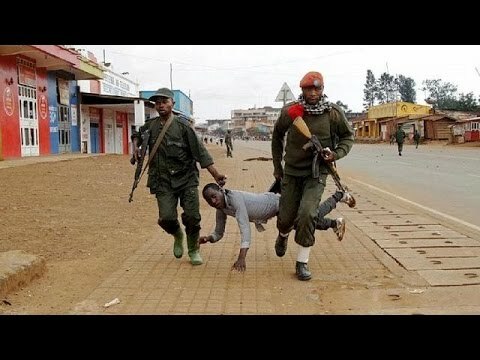 The 69-page report, “‘Special Mission’: Recruitment of M23 Rebels to Suppress Protests in the Democratic Republic of Congo,” documents that Congolese security forces along with recruited M23 fighters from Uganda and Rwanda killed at least 62 people and arrested hundreds more during country-wide protests between December 19 and 22, when Kabila refused to step down at the end of his constitutionally mandated two-term limit. M23 fighters patrolled the streets of Congo’s main cities, firing on or arresting protesters or anyone else deemed to be a threat to the president. The findings are based on over 120 interviews, including with victims of abuse, their family members, witnesses, local activists, nine Congolese security force officers, government and United Nations officials, and diplomats, as well as 21 M23 fighters, commanders, and political leaders. Human Rights Watch conducted research in Kinshasa, Goma, and Lubumbashi in Congo, in Uganda, in Rwanda, and in Brussels, Belgium, from December 2016 to November 2017. Between October and early December 2016, as public pressure on Kabila was escalating, senior Congolese security force officers recruited M23 fighters from military and refugee camps in neighboring Uganda and Rwanda. Many fighters had been based there since the armed group’s defeat in eastern Congo in November 2013. After being transferred to Congo, the M23 fighters were deployed to the capital, Kinshasa, and to Goma and Lubumbashi. The security forces gave them new uniforms and weapons and integrated them into the police, army, and the Republican Guard, the presidential security detail. Congolese army officers – including many from previous Rwandan-backed rebellions who had since integrated into the Congolese army – looked after them, paying them well and providing them with food and accommodation. To protect the president and quash protests, the M23 fighters were given explicit orders to use lethal force, including at “point-blank range” if necessary. On November 5, soon after the United States ambassador to the UN, Nikki Haley, visited Congo and called on Kabila to hold elections by the end of 2018, Congo’s electoral commission (CENI) published an electoral calendar that set December 23, 2018 as the date for presidential, legislative, and provincial elections – more than two years after the end of Kabila’s two-term limit. The CENI also cited numerous financial, logistical, legal, political, and security “constraints” that could affect the timeline. The political opposition and civil society groups denounced the calendar as merely another delaying tactic to unconstitutionally extend Kabila’s presidency. They have called on Kabila to step down by the end of 2017 and for a transition without Kabila to be organized. It should be led by people who could not be candidates in future elections, they have said, and should have the primary aim of organizing credible elections, restoring constitutional order, and allowing for a new system of governance in which basic rights are respected. Iraq’s Murad, Congolese Mukwege bag Norwegian Nobel Peace prize.